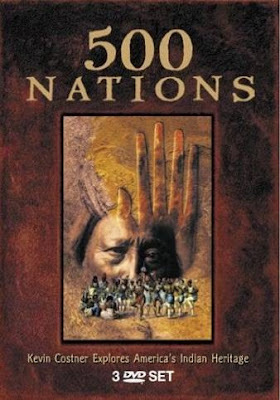 500 Nations is an eight part documentary on the Native Americans of North and Central America. It documents from pre-Columbian to the end of the 19th century. Much of the information comes from text, eyewitnesses, pictorials, and computer graphics. The series was hosted by Kevin Costner, and directed by Jack Leustig. It included the voice talents of narrator Tom Jackson, Wes Studi, Floyd Red Crow Westerman, Eric Schweig, Michael Horse, Gordon Tootoosis, Graham Greene, and Tantoo Cardinal. "500 Nations tries to crystallize the sweeping events that reshaped North America- one of the largest and most pivotal stories in human history - a story we feel is widely unknown. Often painful, sometimes shocking, but in the end it is simply about understanding." Tape # 1: "The Ancestors." Explores the creation stories of several tribes and continues with the early inhabitants, from the Anasazi of the Southwest to the glory of the Mayan cities. Tape # 2: "Mexico." Starts in 650 A.D. and continues with "The Rise of the Aztecs," "The Invasion," "The Fall." This is the most fascinating and my favorite of the series. The complex history is captivating, and heartbreaking as the bloodthirsty horror of Cortez is told, and the commentary by Nahuatl anthropologist Eustaquio Celestiano is enlightening. Tape # 3: "The Clash of Cultures." Columbus' landing on Hispaniola and the conflict that ensues, the "Gulf Coast of Florida" and de Soto's marauding army. Tape # 4: "Invasion of the Coast." The Inuit vs. the English, the East coast peoples vs. the English. Tape # 5: "Cauldron of War." Trading with the white man and how commercial hunting changed the face of the Indian Nations. The Iriquois: The leader known as "The Great Peacemaker" and his "Great Laws" which created the first democracy in America. Tape # 6: "Removal." War and exile in the East. The story of Tecumseh and his heroic challenge. The 1830 "Indian Removal Act" and the journey West. Tape # 7: "Roads Across the Plains." California. The building of the missions and the gold rush. What happened in these events will be new information to a lot of people. Sitting Bull and Crazy Horse: "Standing Against the Tide." Tape # 8: The wise and great Chief Joseph. The Apaches. The Reservations. The "Boarding Schools" where children were stripped of their identities. It ends with present day Native Americans speaking about perspectives today. As Mario Gonzalez, an Ogala Sioux says, "Destiny is not a matter of fate, it's a matter of choice."